No, Bose has not released a pair of lightning cable headphones. But we have the next best thing, an aftermarket adapter cable made by a 3rd party that integrates a DAC and amp, and looks swank too! Bose, one of the titans of the consumer grade hifi headphone industry, made world famous by business class travelers and their amazingly effective QuietComfort headphones. Bose has built a solid reputation for itself making some the best active noise cancelling headphones that can be picked up everywhere from Target to Amazon to your local international airport. We’ve covered what we think to be some of the best sound cancelling ear buds before and we’ve also talked about great high end Lightning connected over-ear headphones, but what we haven’t talked about are over-ear, noise cancelling, Lightning cable headphones. Until now. No, Bose hasn’t begun manufacturing headsets with built in Lightning cables to work with the masses of new happy iPhone 7, 8, XS, XMax and XR owners. We wouldn’t be surprised if this happens, as there are a whole multitude of advantages of Lighting audio over analog and Bluetooth. In the meantime, a third party manufacturer has stepped up to the plate and made a replacement Bose headphone cable that has a Lightning connected tip. 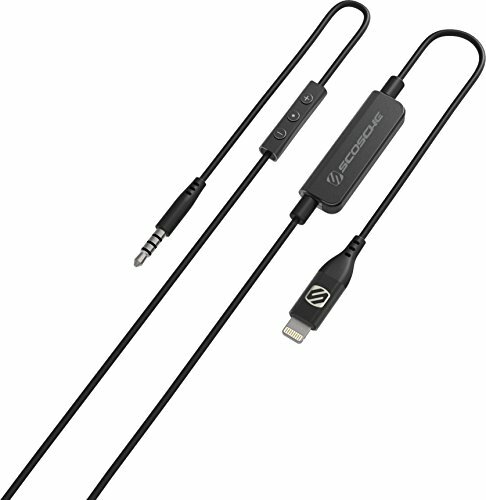 This cord is made specifically to work with Bose headsets, with one end connecting to the headset itself via 2.5mm plug, and the other end connecting to your iPhone 7, iPad or iPod via Lightning connector. The adapter cord, called “Strikeline”, made by electronics giant Scosche, has all the functions you’d expect out of a Lightning-enabled Bose headset. The Strikeline looks very nice. It’s all black, minimally branded, and looks like it came with the Bose headphones they’re designed to work with. Now you can make your Bose “lightning-capable” by simply swapping out your 2.5-to-3.5mm cord with the Strikeline 2.5-to-Lightning cord for a sleek, “manufacturer” looking upgrade. It wouldn’t be a real “upgrade” if you had to sacrifice the ability to adjust volume and answer calls when switching to Lightning. Scosche made sure to integrate a very subtle control so you can take full advantage of Siri on your iPhone 7 or iPad when using your Bose headphones. Overall, the Strikeline is pretty dope and a solid solution for anyone trying to figure out how to use their headphones with their new Apple product.. or for people who just don’t like dongles and think Airpods are dumb, which is most of us. You can grab your own Strikeline upgrade straight off Amazon, and presumably, from a local electronics retailer near you soon. Apple left us all out to dry with their new iPhone and their stupid “dongles”. Well, thankfully companies like Scosche are providing affordable alternatives to clunky adapters. This lightning cable with build in controls is as close to stock as we can get for Bose cans currently, and for that, they deserve to be commended.